A week ago, Apple announced that the Fair Labor Association would conduct special voluntary audits of Foxconn’s Chinese assembly factories at Apple’s request, according to Apple Insider. This week ABC aired part of a video where a reporter was granted unrestricted access to Foxconn. There has been focus on the number of employee suicides and claims of overwork at the facility. The full video isn’t available yet but the 30 minute episode leaves you feeling dismayed and full of questions that Siri probably can’t answer this time around. 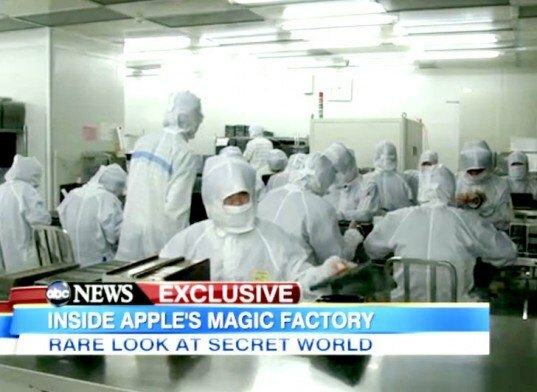 The Nightline episode shows the iPhone is basically handmade by employees in an efficient assembly line. Workers agree to live in dorm style rooms with up to seven coworkers. Their work day is roughly 12 hours and some have moved away from their homes and families just for a chance to work. But they still pay for their own food and board. ABC reports it is about $0.70 per meal and $17.50 a month for the “spacious” dorm. Wages were apparently $1.78 an hour and new workers were required to go through three days of training and “team building” exercises before starting work. All that being said, the video shows an assemblage of people huddled outside of Foxconn squirming in hopes of landing a job. The video definitely leaves you wanting more. You can watch it here. Does this change your mind about your smart phone or is it all fair in love and technology? ← Why won’t Facebook let you follow your friends on Twitter easily?